"Light of a Clear Blue Morning"
(1977) "Here You Come Again"
(1977) "Two Doors Down"/"It's All Wrong, But It's All Right"
"Here You Come Again" is a song written by Barry Mann and Cynthia Weil, and recorded by American entertainer Dolly Parton, which topped the U.S. country singles chart for five weeks, and won the 1979 Grammy award for Best Female Country Vocal Performance; it also reached number three on the U.S. Billboard Hot 100, representing Parton's first significant pop crossover hit. Having been composed by Mann and Weil, the song was a rare example of a Parton hit that she did not write herself. The songwriting duo originally composed "Here You Come Again" in 1975 as a potential comeback hit for Brenda Lee, but when Lee decided not to record it, the song made its way to Parton, who was in the process of redirecting her career as a successful mainstream country artist, to that of an entertainer with broader pop appeal, and was looking for a vehicle to assist with that transition. Her producer Gary Klein had heard the song on the then-recently released B.J. Thomas's self-titled album. Even so, her producer, Gary Klein, told Tom Roland in The Billboard Book of Number One County Hits that she begged him to add a steel guitar to avoid sounding too pop, and he called in Al Perkins to fill that role. "She wanted people to be able to hear the steel guitar, so if someone said it isn't country, she could say it and prove it," Klein told Roland. "She was so relieved. It was like her life sentence was reprieved." 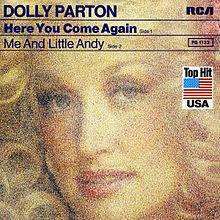 "Here You Come Again" was released as a single in September 1977 as the title track from Parton's album Here You Come Again, and was the centerpiece of her now famous pop crossover move in the late-1970s. The recording spent five weeks at the top of the U.S Billboard country charts and earned Parton the award for best female country vocal at the Grammy Awards of 1979. B.J. Thomas recorded the song for his eponymous 1977 album. Millie Jackson covered the song on her 1978 album Get It Out'cha System. Patti LaBelle recorded the song for her 1981 album, The Spirit's In It. Kikki Danielsson covered the song on her 1981 album Just Like a Woman, with lyrics written by herself in Swedish as Här är jag igen (translated: "Here I am again"). It remains one of the few times the singer Kikki Danielsson was self-involved in songwriting. Maureen McGovern recorded a slower, sensual bluesy version for her 1988 CBS album, State of the Heart. Sylkie Monoff covered this song in 1994 and it was re-released in 2013. In 2006 Clay Aiken covered this song on his album A Thousand Different Ways. In 2006, Canadian Idol winner Eva Avila performed the song on the Top 5 Country themed week. On her episode of The Muppet Show, Leslie Uggams performed the song. Her singing was accompanied by Lew Zealand throwing boomerang fish. This was initially an annoyance for Leslie, but it got worse when Lew started throwing swordfish. In 2014, this song was covered by Kacey Musgraves and Katy Perry on a June 13, 2014 episode of CMT Crossroads. Alternative Rock group They Might Be Giants have covered a portion of this song live in concert, in between verses of Particle Man. 1 2 3 Betts, Stephen L. (2015-12-03). "Flashback: See Dolly Parton's Twinkling 'Come Again' in 1978 | Rolling Stone". rollingstone.com. Retrieved 10 January 2016. ↑ Roland, Tom, "The Billboard Book of Number One Country Hits" (Billboard Books, Watson-Guptill Publications, New York, 1991 (ISBN 0-82-307553-2), p. 204. ↑ Grammy Awards 1979, Grammy Awards. ↑ Steffen Hung. "Forum - 1970 (ARIA Charts: Special Occasion Charts)". Australian-charts.com. Retrieved 2016-10-12. ↑ "NZ Top 40 Singles Chart | The Official New Zealand Music Chart". Nztop40.co.nz. 1978-02-12. Retrieved 2016-10-12. ↑ Whitburn, Joel (2004). The Billboard Book Of Top 40 Country Hits: 1944-2006, Second edition. Record Research. p. 261. ↑ Whitburn, Joel (2002). Top Adult Contemporary: 1961-2001. Record Research. p. 190. ↑ "Top 100 Hits of 1978/Top 100 Songs of 1978". Musicoutfitters.com. Retrieved 2016-10-12. "The Wurlitzer Prize (I Don't Want to Get Over You)"
"Take This Job and Shove It"
"Georgia Keeps Pulling on My Ring"
"Two Doors Down" / "It's All Wrong, But It's All Right"
"Old Flames Can't Hold a Candle to You"
"Tie Our Love (In a Double Knot)"
"Why'd You Come in Here Lookin' Like That"
"The Last Thing on My Mind"
"Say Forever You'll Be Mine"
"To Know Him Is to Love Him"